In some cases or by default you cannot see your Menu Bar in Internet Explorer e.g. File, Edit, View, Favorites, Tools and Help menu. The Menu bar can be turned on and off in your Internet Explorer. If you want to display or turn on your Menu bar just follow the simple steps below. 1. Just press Alt key on your keyboard and it will temporarily show the Menu bar. 1. Open your Internet Explorer. 3. Mark check or click beside Menu Bar to display the File, Tools etc. That's it. 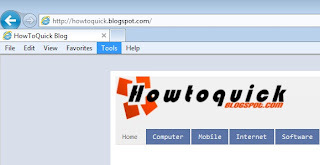 You may also read How To Access Internet Properties in Windows 7.